Over 140 people came together last week to discuss how directors of large-scale projects can better collaborate. 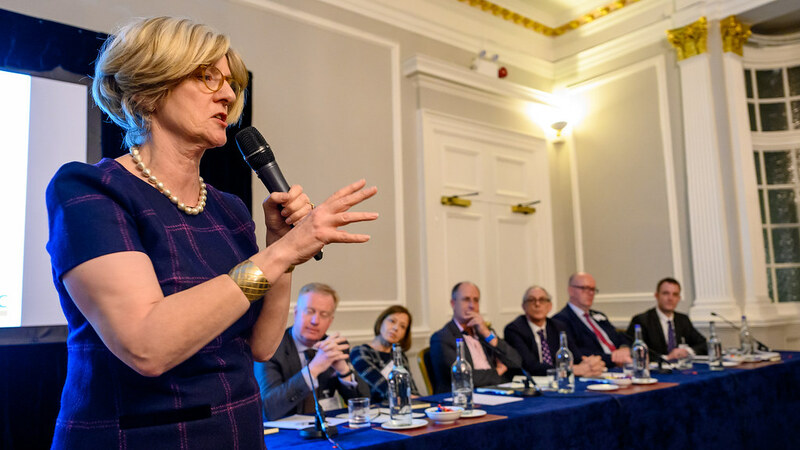 Organised by the School of Management and the HPC Supply Chain Innovation Lab, ‘Orchestrating Industry Collaboration’ took place on 6 February at the Institute of Directors, London. Participants from the public and private sectors and academia heard about some of the pressing issues facing large-scale UK projects. Keynote speakers Ken Owen (Commercial Director, HPC) and Jean-Pierre West (Supply Chain Director, HPC) introduced the Hinkley Point C (HPC) project and talked about some of the challenges facing the supply chain. Ken also spoke on how through working with the University of Bath's HPC Supply Chain Innovation Lab, they hope to educate a new generation of leaders familiar with supply chain management in large-scale projects. Orchestrating Industry Collaboration was part of a series of events focusing on the interaction between business, government and academia to address significant social and economic challenges. It was great to see such an overwhelming response from business, government and academia for our event. All places were booked in a matter of days. This shows how important it is to talk about collaboration between business leaders, policymakers and academics to tackle some of the toughest and biggest challenges through large-scale projects. Collaborations between business, government and academia are needed to create economic and social value for the duration of these projects and beyond. My colleagues and I at the HPC Supply Chain Innovation Lab help to improve industry practice, policy and science with regards to the supply chains inherent in these complex, large-scale projects.